Aipu HVLS Fan is "High Volume Low Speed" fan. It's quiet, stable, cost effective and mainainence free. The core part like motor and VFD are "Nord" and "Rexroth" brand, all imported from German. Aipu HVLS Super ceiling fans are used in large facilities, warehouses, distribution centers, farms, large retail stores, sports arenas, stations, airports and other large buildings, become a ideal choice for ventilation, cooling and dehumidification of large indoor place. 1,Taking advantage of American advanced technology, we manufacture the large ceiling fan with propeller blades, which guarantees continuous air flow in the room even if the fan rotates very slowly. 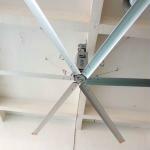 2,The air speed of this ceiling fan is 2-3m/s, which can make people free very comfortable. If the air flow is too strong, people will feel dizzy and tired. So our design is very hommization. 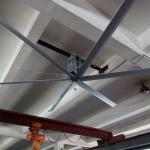 3,The large ceiling fan is widely used in large industrial factory, commercial building, stadium, farm and so on. Our products have already enjoyed great popularity in the market. A: Before you take off from your country, please let us know. We will arrange time to pick you up. Shanghai Aipu Ventilation Equipment Co., Ltd.is located in Shanghai, the largest economic center in China, which owes very convenient transportation to all over the world. Our company was established in 2006 and specialized in producing ventilation equipment and industrial ceiling fan. We successfully developed large calibre non power stainless fan 980 type, which is widely favored by large and medium enterprises both home and abroad, and also made Aipu series non power fan, ventilation the well-known brand in the same industry. 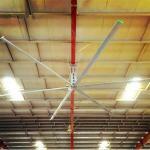 we design and manufacture AIPU KEJI industrial large ceiling fan. Non power fan is produced entirely by high precision advanced equipment, each section of the production is under strictly quality supervision, and based on the conception of brand new technique services. Industrial large ceiling fan with the US advanced technology, innovative energy-saving ventilation concept, the propeller blade was made successfully. When the ceiling fan rotate slowly, it can form endless, slient breeze flows. The blades rotate slowly to push great air flow to the ground ao as to make people feel it like natural wind. Our company constantly adheres to high quality, customer first. We'll provide you very good service, competitive price. Should any of the item be interested you, please don't hesitate to contact.